The indicator displays peak levels of activity formed by the maximum volume, tracks the correlation of the candles on all timeframes (from the highest to the lowest one). Each volume level is a kind of key trading activity. The most important cluster is inside a month, week, day, hour, etc. A volume level receives Demand status if the nearest volume level located to the left and above has been broken upwards. A volume level receives Supply status if the nearest volume level located to the left and below has been broken downwards. 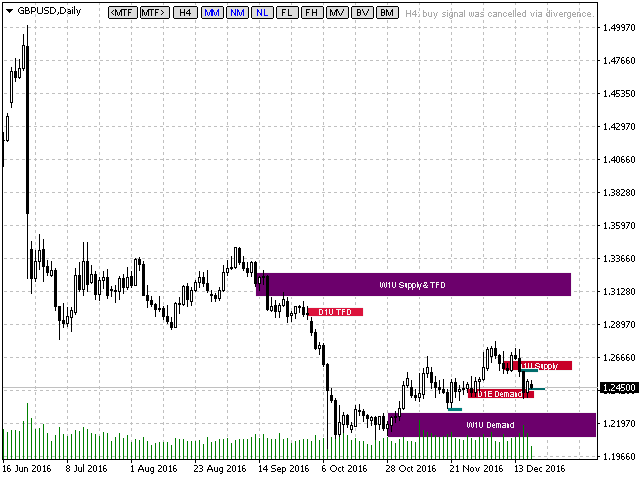 Apart from supply and demand levels, the indicator finds target levels – TFD (Target For Demand) and TFS (Target For Supply). A target level for a demand one is the nearest level located to the left and above and not broken upwards. A target level for a supply one is the nearest level located to the left and below and not broken downwards. 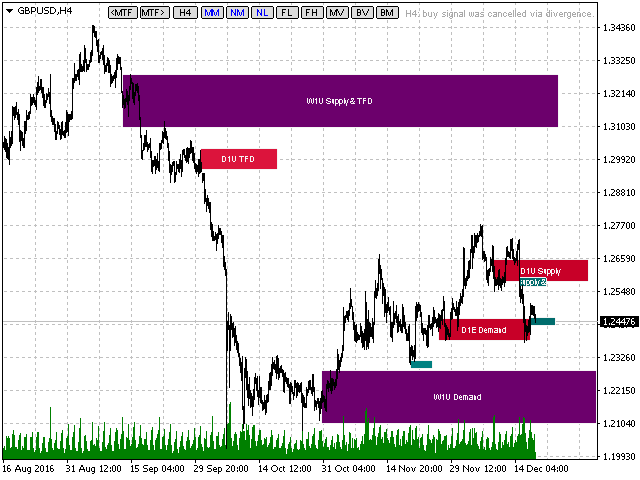 MTF (MarkersTimeFrame) – select the period, starting from which volume levels are displayed. MM (MarkersMode) – enable/disable level display mode. NM (NearestMarkers) – display only several levels nearest by time that are above and below the current open price. The number of displayed levels is set by MarkersLastNearest input parameter. NL (NormalizationLength) – length of levels is proportional to the candle volumes of the timeframe they belong to. 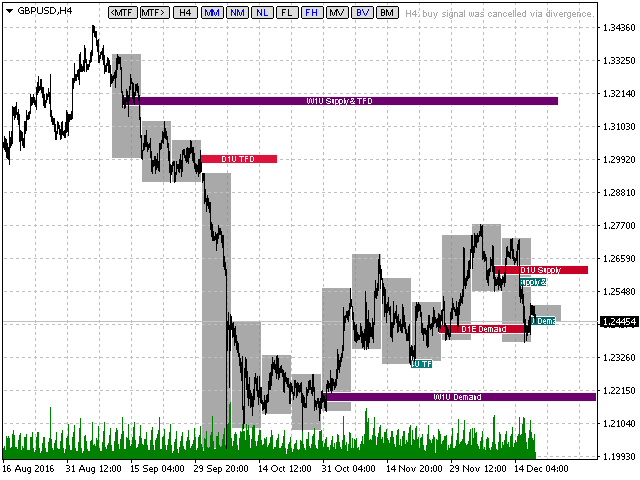 As a result, levels from higher timeframes become longer allowing you to see them more clearly. In normal mode, the length of levels is proportional to the candle volumes of the current timeframe. FL (FixLength) – use the fixed length of levels set in monitor pixels (the length itself is set by MarkersFixLength input parameter). FH (FixHeight) – use the fixed height of levels set in monitor pixels (the height itself is set by MarkersFixHeight input parameter). MV (MarkersView) - representation of levels: thick of thin lines. BV (BordersVisible) - enable/disable period frames. BM (BoxMode) – enable/disable bars coloring mode. Alerts - enables/disables additional showing of trading tips in the alert window. VolumeIncreaseRefutation - cancel the signal if the volume increases as the price approaches the level. BackwardBalanceRefutation - cancel the signal if the total summary balance is reversed when the price leaves the level and returns to it. ShowPreviewMarkers - show/hide the preliminary levels. VolumeType - type of volumes: tick or real if provided by the broker. ButtonsPosition - arrangement of buttons. 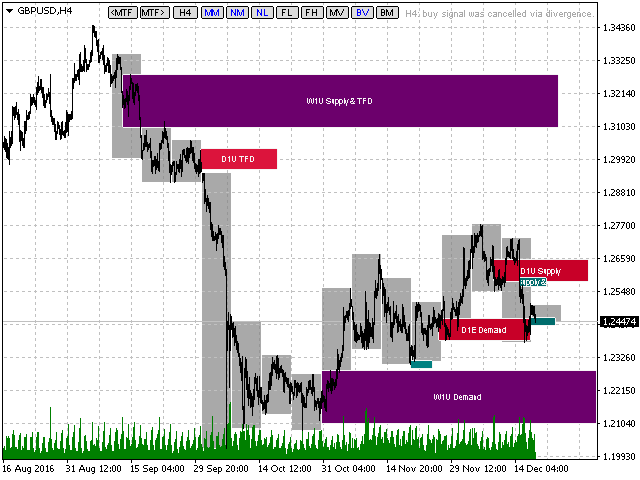 MarkersArea - width of the levels based on the timeframe, measured in ATR. MarkersLastNearest - the number of the nearest levels displayed in NM mode. BoxContrast – visualizing parameter for BM mode, default – 1.0, fractional step. If the chart has too many purple and red bars, decrease the variable value below 1.0. If the chart has too many gray and yellow bars with almost no red and purple ones, set the variable value higher than 1.0. This parameter is set only once. FutureSymbol – if you trade a currency pair or a futures, leave the field completely blank. If you trade index, and your broker provides quotes also for the futures on the index, then enter the name of the instrument indicating that futures in this field, for example, #S&P500_M6. Thus, the indicator will work on the index, but the data on the volume will be taken from futures. The remaining inputs refer to other settings (line color, width or length font size, etc. ), and their purpose is clear from their names. Improved the algorithm of the DivergenceConfirmation function. The function has been renamed to a more appropriate name – VolumeIncreaseRefutation. Added the BackwardBalanceRefutation function, which checks the balance of a price movement, from the moment the price leaves a volume level and up to the moment the price returns to this level after a certain time. The width of the level zones is adjusted for the display mode using broader levels. Note that the level retest level is not only price touching the upper or lower edge, but also penetration up to the middle. Updated algorithm of assigning the Demand or Supply status to levels relative to the trend direction based model. A trade recommendation is formed in accordance with the new algorithm. The algorithm of a reverse model remains unchanged. Before generating a trading signal, the indicator checks for divergence - if the price is close to the level and volumes are rapidly growing, or if the price is approaching the level and the volumes are too low, the trading signal will be canceled, and an appropriate text message will be displayed. Improved Demand and Supply calculation algorithm, and the algorithm of trade signal generation. A trade signal which has become irrelevant due to market reasons (or temporarily irrelevant) does not disappear, but is dimmed instead. In version 2.7, the volume level can also be formed on the last (current) candlestick, provided that the volume of the candlestick before completion has become greater than the volume of the previous candlesticks on this timeframe. An additional literal is added to level names. It specified the trading sessions the current level belongs to, a-Asia, E-Europe, U-America. For example, the D1A name level means that this level has been formed on the candle with a peak volume on the D1 timeframe, and the peak volume within that day came during the Asian session. The field, where the period set using the MTF buttons, is now also a button. When this button is pressed, only the levels of this period are displayed. In this mode the trade recommendation is formed only relative to the specified timeframe as well, without checking the correlation with the higher timeframe. Added new mode for displaying levels - as thin lines with labels above. Due to this, the SV button has been renamed to MV (Markers View) and successively toggles three modes for displaying levels. The indicator provides trading recommendations based on the correlation of Demand and Supply levels on the current and higher timeframes. The current timeframe is the one set by MTF buttons in the indicator settings. The higher one is the next timeframe after the current one. H1 is a higher timeframe for M15, while H4 is a higher timeframe for M30. Trading recommendations are displayed on the chart, as well as in alerts and push notifications. Operation type – buy or sell, as well as recommended entry price, long-term target – tp, short-term target – ntp and profit factor – pf. The long-term target is the target level (TFS or TFD) of a higher timeframe, while the short-term target is a target level (TFS or TFD) of the current timeframe. The profit factor is calculated relative to stop loss and short-term target levels when entering at a recommended price. 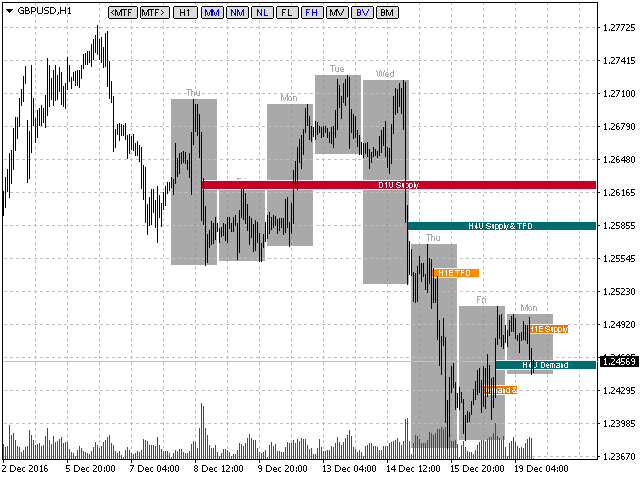 On М1 timeframe – M15 border. On М5 timeframe – H1 border. On М15 timeframe – H4 border. On М30 timeframe – session border (8-hour). 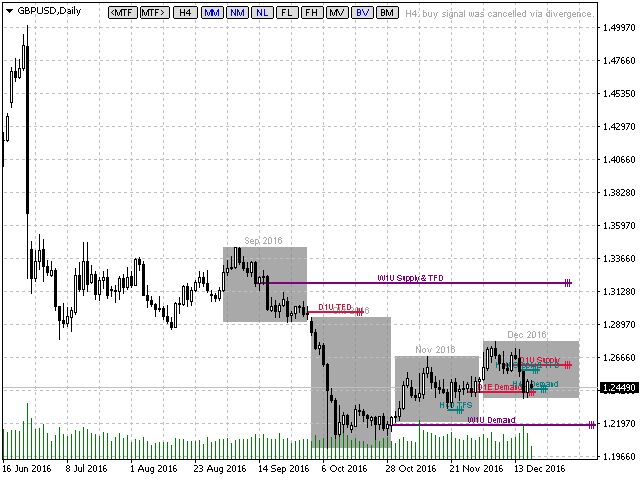 On H1 timeframe – D1 border. On H4 timeframe – W1 border. On D1 timeframe – MN border. On W1 timeframe – quarter (3-month) border. Period borders can be enabled/disabled by clicking on BV (BordersVisible), the color of the borders and text can be selected in the BordersColor input, the font size of the text displayed above the borders can be set up in BordersFontSize. In addition, the volume level can also appear on the penultimate candlestick, provided that the volume of this candlestick is greater than the volume of the preceding candlestick. But this level will only continue to exist if the volume of the current candlestick is lower than of the penultimate one. This level is additionally marked with * displayed in its name, e.g. "*D1" or "*H4-Demand" so that we can understand that this level is only preliminary and can disappear. In the version 2.3, the indicator recognizes the moment a broker starts broadcasting real volumes and switches to them. If no real volumes are broadcast, the indicator works with tick ones. Automatic volume type recognition works similarly when the already existing FutureSymbol option is enabled. 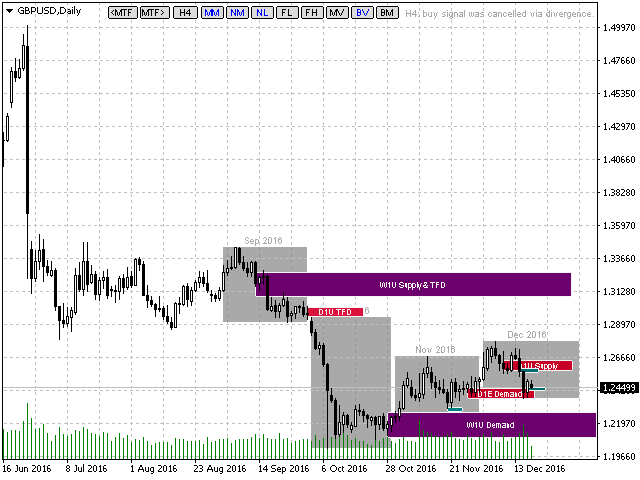 Apart from supply and demand levels, the indicator finds target levels – TFD (Target For Demand) and TFS (Target For Supply). A target level for a demand one is the nearest level located to the left and above and not broken upwards. A target level for a supply one is the nearest level located to the left and below and not broken downwards. Target levels may coincide with supply and demand ones. In that case, they are labeled Demand&TFS or Supply&TFD. Improved the identification algorithm of the supply and demand levels. Added new button – SV (Surround View), in this mode the levels gain a volumetric appearance and seem to rise above the chart. Fixed a minor bug and improved the identification algorithm of the supply and demand levels. The indicator marks supply and demand levels. The volume level receives Demand status if the closest volume level located above and to the left has been broken through upwards. The volume level receives Supply status if the closest volume level located below and to the left has been broken through downwards. The level status appears, changes, or remains unchanged only at the opening of a new candle of the timeframe it belongs to. Overlaying of the same-status volume levels from different timeframes provides a good and accurate entry signal. Added new button "FL – FixLength", in this mode the markers have a fixed length in monitor pixels, specified in the MarkersFixLength input variable. Added new button "FL – FixHeight", in this mode the markers have a fixed height in monitor pixels, specified in the MarkersFixHeight input variable. Improved graphical representation of volume levels (markers). The levels now fit together visually quite well. Each level is signed in accordance with the timeframe it belongs to. MarkersFontSize – font size of the marker on a volume level. 0 - hidden. If the level width is less than the specified font size, the marker is automatically hidden as well. MarkersBorderColor – marker and volume level border color. Volume levels (markers) are now highlighted in different colors depending on a timeframe they belong to. Therefore, the color inputs have been added: MarkersW1Color, MarkersD1Color, MarkersH4Color, MarkersH1Color, MarkersM30Color, MarkersM15Color, and MarkersM5Color. Added the new button/function "NL" - Normalization Length. If 'true', the marker length is proportional to the volumes of the candles in the timeframe they belong to. Thus, the markers of higher timeframes become longer for better visibility of the levels. If 'false', the marker length is proportional to the current timeframe volumes. Improved the volume levels (markers) calculation algorithm. In the Nearest Markers mode, the indicator now displays three markers that are the closest by time and located above and below the current price. Markers are now displayed on the M5 period. MTF – Markers Time Frame, MM – Markers Mode, NM – Nearest Markers, BM – Box Mode.